Huawei Mate 20 Pro and Mate 20 are set to be unveiled by the Chinese company on October 16th, which is when the Huawei Mate 20 and Mate 20 Pro will be officially announced. It is believed that the Huawei Mate 20 Pro will feature a notch identical to the iPhone X, a curved screen identical to the Samsung Galaxy S9 and a glass construction with similar tones as that of a P20 Pro. The cameras will be positioned to a different location and their functionality is also expected to be different. Finally, it is believed that the Huawei Mate 20 Pro arrives with an AMOLED screen and biometric sensor unlock possibility on the screen. Huawei is also going to release its new smartwatch — Huawei Watch GT which will have a 1.39-inch 454×454 AMOLED touchscreen, a Cortex-M4 processor, and a 420 mAh battery. Apparently you’ll get up to 30 days of battery life in watch mode, two weeks of normal usage, and 22 hours with GPS turned on. 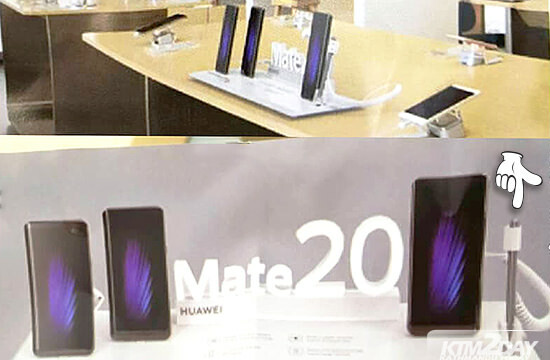 However, two new images of an alleged Huawei store and stand have surfaced on the web . According to the picture we have Huawei Mate 20 phones next to a small stylus. The larger device which is on the right is the one with a stylus albeit a pretty big one. We presume this is the Mate 20X said to be aimed at gamers, but from the images, it seems Huawei has added stylus support as one of its distinguishing features. The Mate 20X will come with an AMOLED display like its siblings but much larger in size. It will also have a Kirin 980 processor and quad rear cameras but it is expected to pack a bigger battery and also have a cooling technology to keep the phone from heating up during extended gaming sessions.Apparently, the device will boast an enormous 7.21-inch OLED display with 2240×1080 pixels of resolution. The smartphone will be equipped with Huawei’s brand new Kirin 980, 4GB, 6GB or 8GB of RAM. And a variety of Internal Storage variants ranging from 128GB to 512GB. Huawei Mate 20X will be the company’s response to the likes of Xiaomi Blackshark, Asus ROG Phone, Razer Phone, and Nubia Red Magic. 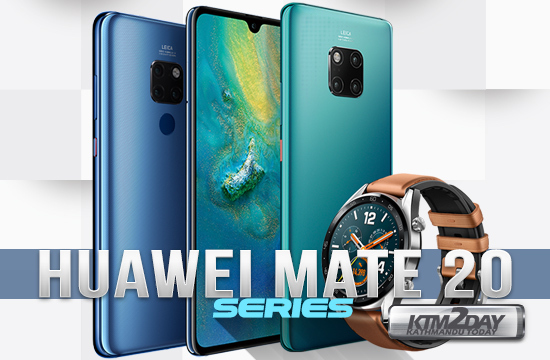 The Huawei Mate 20X should see the light of the day alongside the regular Mate 20 and the premium Mate 20 Pro variant. We wouldn’t be surprised if the Mate 20X also comes with the company’s GPU Turbo feature with a special version of Pie based EMUI. In conclusion, the forthcoming Huawei Mate 20 Pro and Mate 20 along with Mate 20X will be unveiled in London on October 17th. As always, we will be there to bring you the news you are looking for.